Happy September and happy Labor Day! I am excited to say that I moved this weekend and my sanity remained in tact. I haven't yet slept in the apartment yet because we haven't had Internet in the apartment, but that is getting installed tomorrow. We've decided to go without cable for the time being, so that should be interesting! The past few days have been spent cleaning and organizing - the previous tenants left the place a complete wreck. It's coming along nicely and I'll probably be settled in completely by the end of the week. This salad does not look like much, but it is really tasty. It is also incredibly easy to throw together and really low in Points+ value. It is packed with fiber to keep you full. I had it along side a rotisserie chicken leg and was actually kept full all night. Get ready for a whole slew of pumpkin and apple recipes in the next few weeks. Fall is my favorite season and I've got some really great recipes planned! 1. Combine all ingredients in a bowl and refrigerate at least 1 hour before serving. 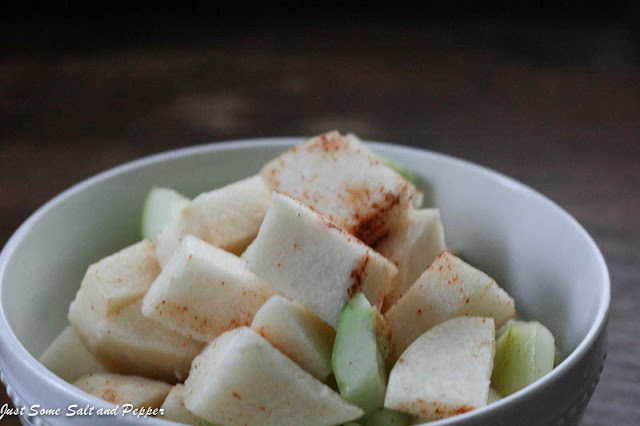 I love jicama! But for some reason, I don't eat it a lot... Might have to change that! This sounds great. Yay for a successful move! And for jicama! Such a refreshing salad. I love these flavors together. So simple but delicious. Exactly what I love! Oh, a life without Internet . . . I feel for you. But I'm glad you are moved! And this looks so good! I've never had jicama, but this could change that! 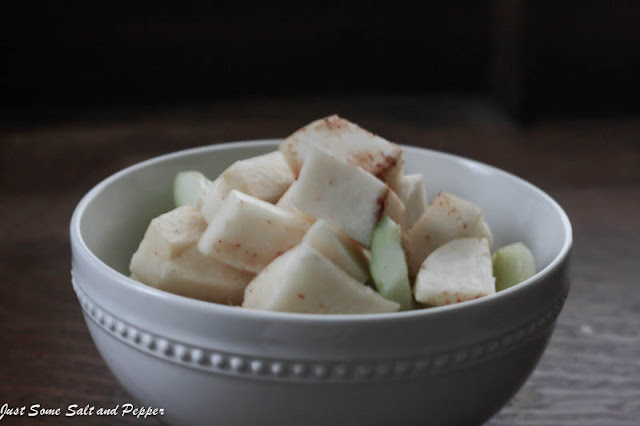 Oooh, always love a good jicama recipe!